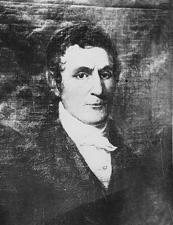 Elected by the General Assembly on February 9, 1837, to fill the vacancy created by the death of Dabney Carr, and began his service on April 10, 1837. Service terminated by death. Elected, 35 Va., iii; died, 38 Va., iii; birth, education, military service, career, and image of portrait, “Richard Elliott Parker (1783-1840),” Biographical Directory of the United States Congress, 1774-Present, retrieved from http://bioguide.congress.gov/scripts/biodisplay.pl?index=P000069 on February 12, 2014; see also the Catalog of American Portraits, reference number NY990445, retrieved from http://npgportraits.si.edu/emuseumnpg/code/emuseum.asp?page=search_basic&profile=cap on February 12, 2014.